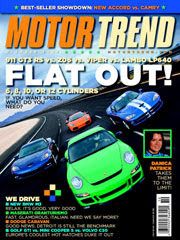 Whether you are pricing out a new sports car for your travels or you simply like hearing a lovely young lady talk about cars, Motor Trend is here to help. For their current issue they’ve enlisted none other than Danica Patrick to review four new cars, despite the fact that she can barely see over the dash of most of these bad boys. Here are some of the Andretti Green driver’s thoughts about the cars she tested, with links providing full video reviews. Oh, I’m sorry – was she talking about cars? There is no pleasing that woman. She can even complain about some of the greatest road cars available (to a very rich few) right now. As far as I'm concerned, anything she now has to say isn't worth the paper, or the bytes, it's written on. She doesn't deserve the air space. Looks like Paul Hosepenthal has been posting comments again.